⚓ T204873 "Special page" tab accidentally renamed to "CollabPad"
"Special page" tab accidentally renamed to "CollabPad"
"Party Time" token, awarded by Liuxinyu970226. "Party Time" token, awarded by Framawiki. 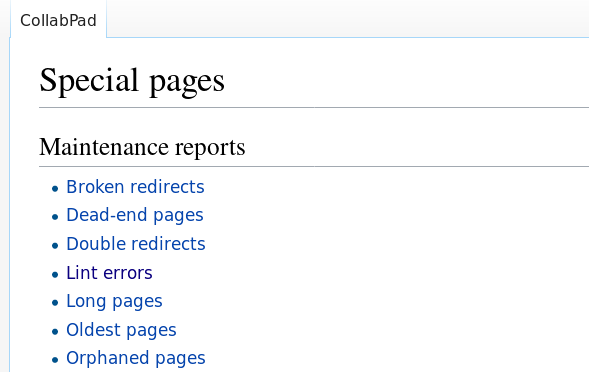 On special pages like https://www.wikidata.org/wiki/Special:SpecialPages the top tab says "CollabPad" instead of "Special Page" like at https://en.wikipedia.org/wiki/Special:SpecialPages . https://www.wikidata.org/wiki/Special:SpecialPages?uselang=qqx returns the message https://www.wikidata.org/wiki/MediaWiki:Collabpad , but that should be nstab-special (https://www.wikidata.org/wiki/MediaWiki:Nstab-special) according to https://en.wikipedia.org/wiki/Special:SpecialPages?uselang=qqx . Resolved Esanders T204873 "Special page" tab accidentally renamed to "CollabPad"
Legoktm triaged this task as Unbreak Now! priority. Legoktm renamed this task from "Special page" accidentally renamed to "CollabPad" on Wikidata to "Special page" accidentally renamed to "CollabPad" . Legoktm removed a project: Wikidata. [mediawiki/extensions/VisualEditor@master] Revert "CollabPad: Show current sub-page as separate tab"
Revert "CollabPad: Show current sub-page as separate tab"
Jdforrester-WMF edited projects, added VisualEditor (Current work); removed Patch-For-Review.